Unpredictable things happen in war. What starts as localised conflicts can quickly spread and engulf whole nations for years. How lucky are those nations whose statesmen have their heads screwed on and act appropriately based on the national interests of their people. While the Israel-Hamas conflict goes on, it worries me that Iran could be drawn into such military confrontation, not based on any national interest but purely for the adventurism of the Islamic Republic leaders to become the heroes of not the Iranian nation but of the Arab world. 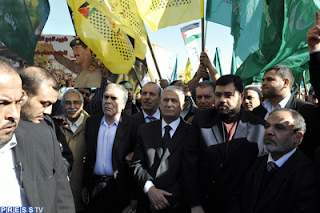 Some baseejis have given ultimatums to Jordanian and Egyptian diplomats in Iran to either leave or defend Hamas. A similar mob have broken into the British embassy ground in Golhak gardens and occupied the grounds, lowered the Britsh flag and hoisted the Palestinian one. 'Martyrdom' forms have been handed out to send volunteers from Iran to defend Hamas. Brigadier General Baqerzadeh, Head of the Foundation for the Remembrance of the Holy Defence, asked for military intervention in Gaza. THIS IS NOT OUR WAR! Iranians have no national interest in getting involved in this conflict. Hamas is no friend of our nation, if you don't believe me just look at this picture of Palestinian delegation protest outside the UN building in Beirut. Hamas official, Osama Hamdan can be seen in front of the picture while another protester is holding up a picture of Saddam Hussein, the enemy of our nation and the dictator responsible for the death and maiming of hundreds of thousands of our people, in the back. I think it is every freedom loving person's war. Support of Israel in this crucial time is important. Hamas is the enemy of the Iranian people and the enemy of humanity and liberty. We should stand by the Jewish state since standing by Israel is standing against the Mullahs of Iran. I believe this is our war. I have noticed that most Iranians do not support either of the two sides, but will usually pick the Palestinians as the lesser of the two evils. I'm willing to bet that anti-Israel propaganda is everywhere in Iran. I am just coming from Tehran. The anti bush propaganda and anti Israel propaganda are at its highest. IR TV shows pictures from Mecca pilgrims and how they throw stones at the Satan idol and blend in how Bush is thrown with shoes, over and over again to impersonate him as the Satan himself. But they also show pictures from Gaza war you guys dont get to see here in the West. I have seen many children's corpses being carried to hospital while the parents were crying for help. I bet the West didnt broadcast these footages from Gaza. Yes you throw stone we throw missiles you throw missiles we throw nukes, Israel the land of the free, sadly it's not there Land. nobody can say different. Any war is sad, any war has innocent casualties, anyone has the right to feel sorry for the victims, but it does not mean we should JOIN the war. How many innocent children do you think got blown up or butchered by the Russians in Chechnya? Does any one suggest we should have gone to war with Russia? When Saddam invaded Iran, did Hamas fight on our side? of course not, and I most definitely think that Iran shouldn't even be involved in the first place. No. It is not Iran's war. This is true. And yes, the IRI's support for Hamas is aimed at winning the hearts and mind of Arabs, not genuinely saving the lives of Palestinians. But winning the hearts and minds of Arabs is in Iran's national interest, for much of the same reasons that it is important for the U.S. to have the support of neighboring Latino countries. It helps prevent Arab aggression towards Persians and to facilitate the Iranians economic interests in the region - which, in turn, allows the Iranian economy to grow. But honestly Azarmehr, I heard you talk about the killing of thousands of dissident Monks in Burma as a tragedy. How could what's going on in Gaza not be a tragedy? Screw the IRI - they are clearly in it for their own reasons. And it is not about being anti-Israeli. It's about seeing what's wrong and calling it as it is. If anything, what the Israelis are doing only makes the IRI stronger (which makes it our war). It was probably on the orders of the IRI for Hamas to even break the cease-fire! The Israelis cannot fight against a sentiment and defeat it - that is what they are doing. You can call it Hamas all you want, but there should be no doubt that this only perpetuates the cycle of violence. And if or when Hamas is defeated, the sentiment will be transferred to a new "resistance" group. Just look at the Kurds. Have the wars against them by Saddam, the Shah, the Turks, etc. stopped them from pursuing their national objectives? No. And the Taliban in Afghanistan? They have been wiped out. You know what U.S. intelligence calls the new group that has taken its place? The Neo-Taliban. Do you get my point? Any Israeli act of violence and aggression towards Palestinians increases the IRI's power and influence in the region. Remember the 2006 war in Lebanon? So if you can't come to sympathize with human plight, i.e. Palestinian plight, because the IRI supports them, then at least oppose Israeli aggression towards Palestinians, because when they do act aggressively it becomes OUR war. It was even in the Winograd Commission's report on the war in Lebanon. The Israeli commission itself reached the conclusion that the war empowered the IRI. And what is this blog all about? Establishing democracy in Iran and removing the corrupt religious dictatorship in Iran, right? It is in YOUR interest to denounce Israeli aggression, and in the interest of all IRI opponents. In fact since the mullahs in Iran hate Israel more than Iraq, they may be willing to sacrifice 2 to 3 million Iranians instead of the 1 million lost to Saddam! First of all I am glad we are reaching a concensus that this is not our war. As for whose side we champion in the moral dispute I think we should have a free whip, but this should not mean threatening other diplomats, recruiting martyrs, attacking UNESCO, calling for a Muslim army etc. All this can lead to our involvement in a war which is nothing to do with us. Sorry did you not look at the picture in the post? After all the moral, financial, physical and all the other forms of help and support given to Hamas by the Islamic Republic, their hero is Saddam Hussein!!!! When Saddam was using chemical weapons against our soldiers, I saw no Arab extremist groups recruiting martyrs to fight on our side! I saw no Arab demos against Saddam's embassies. These terror groups are in it for the take only, they never give anything in return. And its such a warped logic to suggest that to stop the Arab aggression against Persians we should become more and more like Arabs! On principles, Gaza Israeli conflict has got nothing to do with Iran. But in a wild scenario, if Israel similarly attacks Iran because of Islamic republic's poking around, then I hope there will be real support for the Iranian people to remove and uproot the Islamic regime. Otherwise, again the Ayatollahs or their cronies will be re-energized. If the Ayatollahs or their tentacles do not survive, who is going to be in power then? There is no viable opposition. Perhaps the US has some sort of contingency. Ideally the safest bet would be the reinstatement of pre-1979 Iranian Constitution with transitional government made up with surviving members of the legal government of pre-1979, dissidents and scholars. Immediately next a UN backed referendum on political system. Then we move on to reconciliation and justice for the crimes of the Islamic regime, while abolishing capital punishment, after all we are not Iraqis. Wish full, I am. Happy New Year and wishing you all and Iran all the best. I agree with Potkin: if you are trying to fight the Islamist state in Iran, a great strategy would be to work against the IRI's efforts at building inter-Islamic solidarity by highlighting the inter-ethnic tensions between Persians and their Arab neighbors. This could help to prevent Iraq from falling into IRI hands as well: by insisting emphatically that there are serious tensions between IRAQI shi'a and IRANIAN shi'a, you can limit the IRI's influence in Iraq. Barmakid is an Arabised Iranian, so what he doesnt understand and never will understand is that some ethnic groups do not want to be arabised, or have the arab religion imposed on them by force (which is part of the arab imperial project that barmakid supports) thats why the Spanish repelled the moors, the Greeks repelled the Turks, and now the Israelis are fighting the Palestinians ... because they dont want an Arab religion forced unto them. Iran no longer has that choice but has tried to differentiate itself by preserving in part its language and in part its practice of Islam (Shia not Sunni) ... the present ISlamic Republic however wishes to arabise Iran and that is why it intends to make the war of the Arabs - Iran's war ... The Islamic Republic cares nothing for Iran but only for its facistic interpretation of Islam. Those uninitiated with the byzantine nature of Middle East politics are missing the bigger picture. What we are seeing are the first steps of a new dynamic in the MidEast. As the US withdraws from Iraq the two parties are jockeying to fill in the vaccum. On the one side we have the Islamists and on the other the a secular front. This has thrown up strange alliances with Israel/Fatah/Egypt/Jordan/Saudi/Turkey vs Iran/Syria their proxies Hamas/Hezbollah. As Bush & Olmert are both leaving office this window is bein g used to neutralise in part Hamas. In the long run i’ll doubt its effectiveness - Islamism has to be confronted head on by muslims acting in their own self interest. In Iran the crackdown has been more intense than reported in the Western media. Closing down of papers with the slightest dissident views isnt the only step the clerical facists have taken. Largely unreported but far more significant has been the raiding of the offices of activists like Shirin Ebadi and the personal attacks on her. Earlier this month the Iranian authorities closed the Tehran office of the Human Rights Defenders Centre headed by Ms Ebadi, saying it had operated for eight years without permission. Ms Ebadi, a 61-year-old lawyer and human rights activist, became Iran’s first Nobel Peace Prize winner in 2003. Today her home was attacked by the same government hired mobs that have intimidated students and attcked various European legations. I see that the usual suspects - the “Anti-Zionist” (anti-semetic) front as usual do not give a fig about the supression of free thought and speech in Iran by the facist Islamic clerics. The reactionary Left remain true to their thuggish racist roots. Its also worth noting how the BBC carefully omits that the Islamic authorities have accused Ebadi of “the crime” of supporting Israel when seizing all her political case files. Ebadi uses these files in her often vain attempt to represent political prisoners in the Islamic courts. It is so typical of the BBC to whitewash the Islamic Republic. Here for instance is a typical BBC piece from less than a year ago by BBCs waste of space correspondant Pam O’Toole on Ebadi & Ahmadinejad. [Although in O’Tooles defence she isnt any worse than Jim Muir & Frances Harrison]. I am not suggesting we become "like" Arabs. But if we let people like you take the lead we will be dwelling on the past until the day you die. There comes a time when a nation must progress and mend its cultural deficits with its NEIGHBORING countries. So what if they're holding a Saddam picture? Do you even know what it says on the poster? No, so take it easy and stop taking the most trivial things and making them the center of the debate. Do you realize how retarded you are? You're making the whole debate about a frikkin picture some schmuck decided to hold up during a protest. Iran is not special, it cannot go on isolated from its Arab neighbors, they have to work together. Just as America actively tries to quell the anti-American sentiment in the neighboring Latino countries, Iran has done so and moved on to a new stage of diplomacy with its Arab neighbors. You need to read some new books and stop relying on your decades old presuppositions and resentments. p.s. You clearly didn't read my first comment: THIS IS OUR WAR. The Israelis know it - when are you going to figure it out? He was quite solicitous about Jewish power throughout the world - as you can tell from the clip. And I tell ya, the more I watch him the more it makes me like him... he presents a different image of himself than what I have read about him. But nonetheless these are like 3min clips from which his nearly 40year tenure should not be judged. Actually Barmakid, Those of us who are more savvy than you do know what is written on that picture, It says Shahid Saddam, 'Martyr Saddam'. Well let 'Martyr Saddam' join their war. Mr. Rostam Farrokhzadeh and The Anonymous who commented before him. Thank you for your perceptive and intelligent contribution to this discussion. I tend to think that 'this is indeed our war' but not our war against Israelis or the Hams. This is our war against the so called 'students' / Basiji / Pasdaran/Mosque's thugs — otherwise known as the fascist storm troopers of the Fascist Mullahs 'ever present' on the streets of Iran who are ready to create mayhem and stab and kill anyone who is not on their side or disagrees with them. There will have to be a time — when Freedom seeking Iranians have to stand up to them in the streets and confront them. I know it will be bloody and tough and I am not trying here to write prescription for anybody to do it willy nilly and get themselves killed or injured by this bloody mob — but somehow — the people of Iran have to organise and empower themselves to do what is ultimately needed to rid the Iranian society of this cancer which was brought upon people of Iran by the Khomaini phenomenon. Other people in other counties have faced the same situation and have been breve and have taken the fight to the Fascist and have won. I am sure that when the time is right — the same will happen in Iran too. Support Israelis and wipe out Hamas. Then wipe out Hezbollah. Better yet, wipe out the Iranian regime and we'll be rid of them all. I absolutely agree with Winston. We lost the luxury of watching from the sidelines some time ago. Israel is our last, best hope (and I'm not even Jewish). All of us who want to continue to live in a free world should back Israel (though not uncritically) and give it our support. We should stay well clear, not only of the rent-a-mob lefties and habitual West-hating dope heads, but also of the temptation to say 'well, you know, this has really nothing to do with us'. It has EVERYTHING to do with us. Would Hamas stop people in Sistan va Baluchistan blowing themselves up? Did anybody even notice that baluchis are getting more and more "restless" and progressed from attacking and killing a few policemen to suicidal car attack? Will arabs help when baluchis and probably other nationalities in Iran (and Iran have couple who are neither persian nor shia) start getting more angry? Or will they support baluchis and other sunni in their quests for completely separate or more independent teritory? No, they probably would not. But that is not how I see the conflict. That is how you and Azarmehr see the conflict. Maybe my example of American efforts in Latin America can explain better the way I see diplomacy in the region. I tried to help you by saying what it says on the picture. Whether you were a moron or had eye sight problems was not my concern, I just wanted to help you because you need help badly.